A gathering of many leading Chinese wind project developers, consultants and stakeholders has welcomed the introduction of wind lidar provider, ZephIR Lidar, to the local market, working in collaboration with Saiwind Inc. during a technology workshop held in Beijing. ZephIR provides remote wind speed measurements and characteristics from ground level, both onshore and offshore, in addition to turbine mounted applications through the use of continuous wave lidar technology. Measurements are provided at ranges from 10m to 200m without the need for traditional tall met masts. 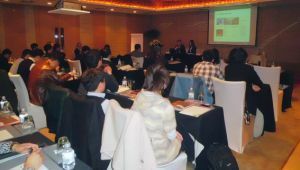 The workshop, hosted by ZephIR Lidar and Saiwind Inc  ZephIR Sales Agent in China – introduced the innovative wind lidar technology for remote resource assessment during the assessment of wind farms, to a range of wind related companies in China. The leading wind lidar technology, ZephIR, was reviewed and reflected upon in relation to traditional wind measurement methods. A number of key objectives were also agreed to develop potential pathways to expand the emerging market. The workshop, attended by more than 50 parties represented government agencies, power generation groups, turbine manufacturers, consultancies and research institutes. In the opening remarks, President of China Wind Power Association Mr. He De Xin expressed that in the context of a government plan to attend IEA Wind seminars, the workshop would provide significant input, and develop a better understanding, of Lidar technology and its application in wind assessment. Mr.Wang Jixue, Deputy Director of New Energy Dep of Hydropower, Water Resources Planning and Design General Institute, stated that there is a growing competing interest over offshore wind resource around China. There is an urgent need to clarify the key elements for sea utilization and to ensure an integrated offshore wind power supply chain and service systems. To that end, the company are extremely interested in the significant role ZephIR Lidar will play in offshore wind projects. Ian Locker, Managing Director and Dr. Chris Slinger, Scientific Advisor both from ZephIR presented on the value of ZephIR Lidar in wind assessment in both a ground based application with original technology ZephIR 300, and in a turbine mounted application with new product launch ZephIR Dual Mode which permits both nacelle mounted power curves / yaw misalignment correction as well as ground based verifications in front of the turbine. In the closing remarks, Mr. Hu Lin, CEO of SaiWind Inc, highlighted the need of utilizing the world leading technology  ZephIR Wind Lidar in wind industry for a promising future.